My boys needed to 'take a jar' to school today. It was a free dress day and the 'price' was a jar full of something, to be sold at the school fair in October (I can't believe that's next month already!). This is on top of the money that's been sent in for show bags and ride armbands, major raffle tickets, class stall donations, and soft drinks (another free dress day for the drinks van stock). But it is the major fundraiser for the year and it's a fantastic community day. This year they're even having fireworks! So, inspired by the amazing Bakerella (her photos are SO much better than mine), I put together these jars of 'Emergency Cookies'. After spending some time researching (ie. blog surfing) this idea seems to be happily American, but I have to say, having now made 2 batches straight from the jar (testing my recipes), it's pretty catchy! Bakerella's recipe fitted in a 1 quart jar (I have no idea how big a 1 quart jar is) but I wanted to use jars i already had, and minimise the cost of the ingredients wherever possible. I'd happily put heaps of M&M's in a jar for a friend, but at nearly $4 a bag I was trying to be sensible here. And I used the bag of orange flavoured M&Ms which really added to the taste. The pink ones that are in the shops in October will look really good too. I'll definitely make some jars up when they come out. I made a couple of batches and ended up prefering the batch that included cocoa and included more butter so spread out while cooking. Now, I'm no Masterchef, but this is the combination I settled on. Pack it all down in layers (if there's space I'd add more nuts or M&M's if you have them). Once it's all combined, roll into balls about 1 tbsp each, leaving room for spacing, and bake on baking paper covered trays at 180 degrees celcius for about 12-15 mins. I needed 2 trays because one jar made about 30 cookies. They were a big hit with the kids, and I enjoyed the alchemy of it all, and making up the labels. I'm not sure how to offer you a link to download the labels I made, but if you're keen, just leave your email address with a comment and I'll send my pdf file to you. I printed it out on gloss photo paper and glued to the jar. The fabric was 15cm square and the cord was about 60cm in length for each jar. If you've got some ideas on how to improve this recipe, I'd love to hear them too. Now I'm off to bed, I need an early night for a change. Lots of painting to do tomorrow as it's the only day of the week I have a few hours of daycare for the lovely Sophia. When I had a PDF to share, I created a google group with my blog's name, uploaded it to the "Files section" and then linked to that :) The labels look great! Unfotunately there will be no pink and white M&Ms this year according to the Mcgrath Foundation. Such a shame! What a fabulous idea - might have to steal this one for Christmas pressies. I got here from Taste.com.au after reading your review on the Abby's Cookies in a Jar so had to come and check these out - you have made me realise this is a gift I can give all year round and great idea for selling at school fetes so thank you! Oh and you have just got yourself a new follower...great blog!! Hi! 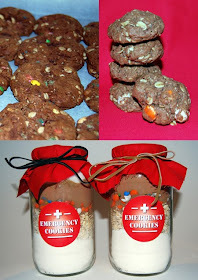 I'm love the idea of your emergency cookies and I'm planning to make them as a gift for friends and family this Christmas. I know you posted this a long time ago, but if you still have the template, could you email it to me? My address is lucywhidden@gmail.com. Thank you for sharing your wonderful ideas! I hate to admit it, but I do love comments! Please make sure you have email 'enabled' or leave an address, or I can't stay in touch, sorry! If you've found this blog - thanks! But please click over to my new, current blog - www.shinyhappyart.com/blog/ See you there!